More than a hundred protesters marched in downtown Clayton on Sunday afternoon and demanded the release of 22 people who were arrested at the Saint Louis Galleria on Saturday. It wasn’t so much of a protest as a vigil on Sunday as demonstrators gathered at the Justice Center in Clayton to wait for the release of the people arrested Saturday at a protest in the Galleria. By 5 p.m., all 22 of those arrested had been released. St. Louis County Police issued charges to seven of the 22 people arrested Saturday, mainly for rioting or resisting arrest. The other 15 were released without charges by the prosecuting attorney's office, county police said. Those people were referred to the Richmond Heights Municipal Court. The protests on Sunday were originally called to meet in Ferguson’s January-Wabash Park, but quickly relocated to Clayton. People have been demonstrating for nine days throughout the region since a judge found Jason Stockley, a white police officer, not guilty of first-degree murder for the 2011 shooting death of Anthony Lamar Smith, a black man, who was suspected of dealing heroin. 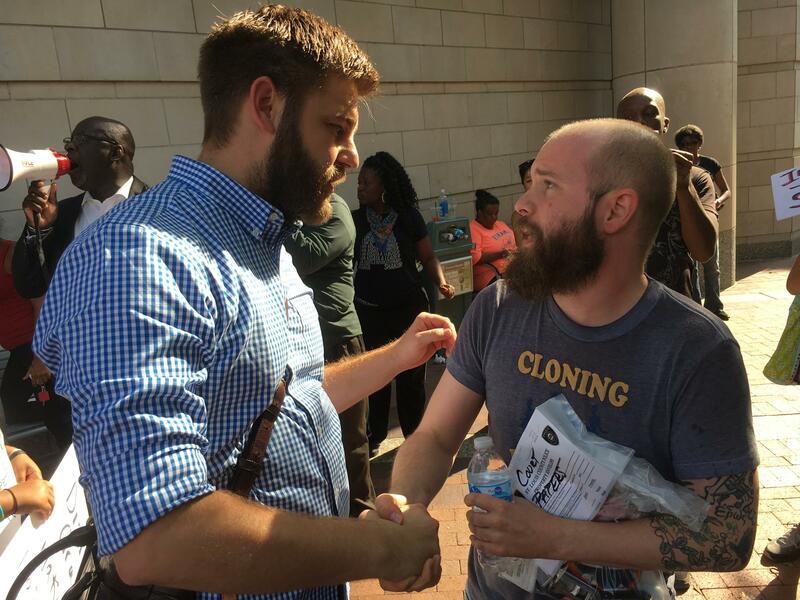 People marched in downtown Clayton on Sunday afternoon to protest a judge's decision to acquit former St. Louis police officer Jason Stockley of first-degree murder of Anthony Lamar Smith and the arrest of 22 people who were at the demonstration at the Saint Louis Galleria Saturday afternoon. Siblings Miguel and Xochitl Flores, 22 and 18, were among the protesters gathered in Clayton. It wasn’t the first protest they attended, but they felt compelled to join on Sunday because one of their friends had been arrested at the mall. Eventually, the protesters left the Justice Center and took the demonstrate through downtown Clayton. They blocked several intersections throughout the business district as police in riot gear stood off to the side and let protesters move on. One protester, Cydney Johnson, 27, said he lives in the same neighborhood as Anthony Lamar Smith and thinks the federal government needs to step in to change how police treat citizens in St. Louis. "If we can get at least a federal bureau to get involved in investigating how the St. Louis police are involving themselves in matters of the inner city streets, then we can possibly find some answers and stop the horribleness of the adjudication process in itself," said Johnson, co-chair of the St. Louis Democratic Socialists of America. Before demonstrators headed to Clayton, some reflected on how they met in Ferguson for the first time. Some people protesting now were heavily influenced by the movement that arose after Michael Brown’s 2014 shooting death in Ferguson. Zachary Becker, right, was released from prison on Sunday after being arrested at the Galleria on Saturday. The ArchCity Defenders issued a statement on Sunday, claiming that county police denied the attorneys access to their clients in the jail. “At every turn, our lawyers were met with delay, miscommunication, and a general indifference to the rights of the people arrested and the attorneys who work with them,” said Thomas Harvey, executive director and co-founder, of ArchCity Defenders. One of the people ArchCity Defenders is representing is Karla Frye, an elder at the St. Peter AME Church in St. Louis. A St. Louis Post-Dispatch photographer took a picture of Frye jumping on a police officer’s back and then being choked by a police officer. The Riverfront Times reports that Frye was objecting to how police were treating her 13-year-old grandson. Frye was released Sunday afternoon and did not take questions from reporters. St. Louis County Prosecutor Bob McCulloch’s office charged Frye with assault in the third degree, rioting and two counts of resisting or interfering with arrest. Protesters claimed victory Sunday after the St. Louis County Justice Center released all 22 who were arrested at the Galleria protest Saturday. Nathaniel Carroll, an ArchCity Defenders attorney, said Frye may be one of the first people charged under a law enacted this year by the Missouri legislature that increases punishments for assaulting law enforcement officials. If you are a legal professional, please help us report on this ongoing situation. Tell us: How is the Stockley verdict affecting you? Updated at 11:15 p.m. Sept. 23, with additional details — The continuing protests over a judge’s decision to acquit former St. Louis police officer Jason Stockley of murder returned to the Galleria mall on Saturday, where police ended the demonstration and made 22 arrests. Many in St. Louis are outraged that St. Louis Circuit Judge Timothy Wilson found Stockley, who is white, not guilty in the death of Anthony Lamar Smith, who was black. 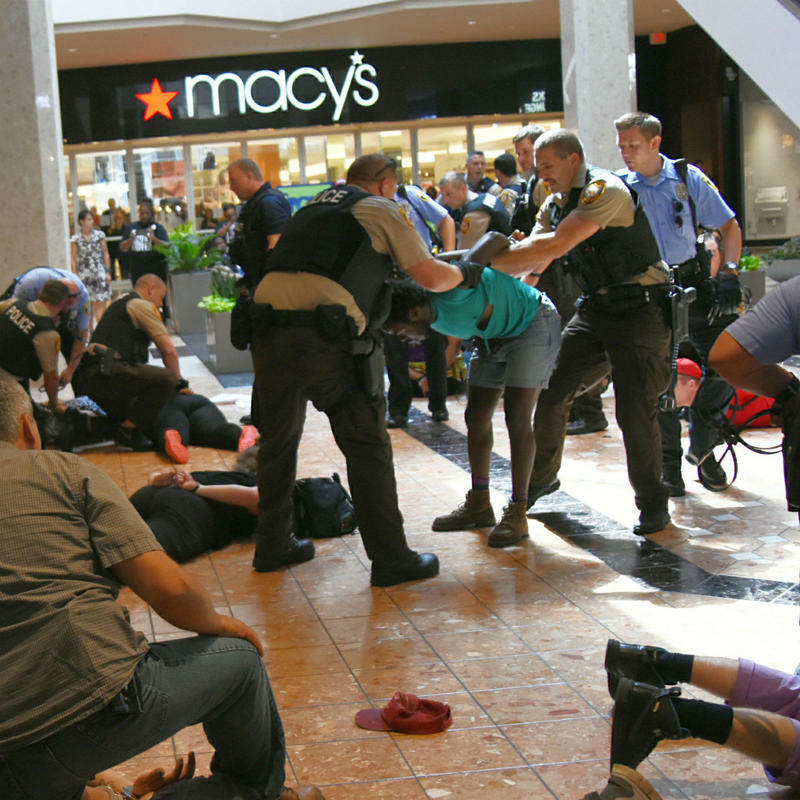 Protesters marched through the mall to declare that there would be no business as usual until the St. Louis region reformed its criminal justice system.